Qualcomm Inc. (NASDAQ:QCOM) reported adjusted sales and profit that topped analysts’ estimates in the period that ended in March. The company reported that net income fell to $749 million, or 50 cents a share, in the fiscal second quarter, which ended March 26. On an adjusted basis, profit was $1.34 a share, compared with an average estimate of $1.19. Revenue increased 8 percent, rising to $5.99 billion. Analysts had expected revenue of $5.87 billion. The company said a push into new markets bolstered sales in the second quarter. Profit was helped by sales of chips used in cars, networking and the internet of things. The automotive chip market is expanding rapidly as automakers cram more electronics into their vehicles in the race to make cars autonomous. The company’s semiconductor unit exceeded expectations, lifted by demand from outside the smartphone market. Apple Inc. is suing Qualcomm, claiming the company abused its position to create a monopoly in chips. Apple also alleged Qualcomm had withheld rebate payments as punishment for Apple’s cooperation in a Korean regulatory probe of Qualcomm’s licensing practices. Apple is requesting $1 billion in compensation in the case. 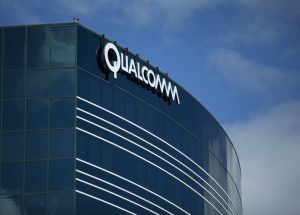 Qualcomm has countersued. Its licensing business, which generates the majority of profit, didn’t receive full royalty payments associated with Apple’s phones in the quarter. Qualcomm admitted that contract manufacturers underpaid royalty payments in the fiscal second quarter to the tune of about $1 billion. The company now says sales in the third quarter will be $5.3 billion to $6.1 billion and profit was forecast at 90 cents to $1.15 a share. That compares with average analysts’ projections for sales of $5.93 billion and profit of $1.09 a share. The company is also dealing with regulatory investigations in the U.S., South Korea, Taiwan and Europe. Last week, Qualcomm said it would pay $814.9 million to end a royalty dispute with BlackBerry Ltd. Qualcomm said the judgment has no bearing on other cases.